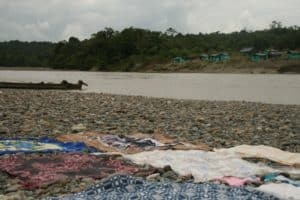 In a landmark ruling, the Colombian Constitutional Court adopted an unprecedented ecocentric approach to human rights: the judges recognised Colombia’s Atrato River as a legal entity with environmental rights that need to be protected alongside the communities’ bio-cultural rights. Thus, the Court acknowledged the inherent interdependency between the environment and communities in the Atrato region. The Court ordered the Government to take a series of measures to protect the Atrato River and combat illegal mining in the region while taking account of “the environmental and social realities of the nation” . The Court also reiterated once again the right to free, prior and informed consent for ethnic communities. 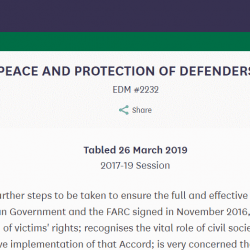 This milestone judgment is another major success for ABColombia’s partner organisation Tierra Digna , which brought the Atrato case before the Colombian Constitutional Court. 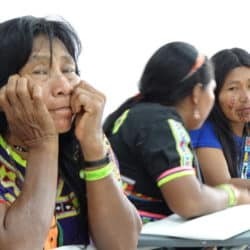 For several years, alerts by the afro-Colombian and Indigenous communities and their representatives concerning the urgency of the problems in the Atrato region have largely been met with indifference by the Colombian government. Today, however, the problems have culminated in an unprecedented environmental and humanitarian crisis due to the contamination of the river with toxic substances, erosion, accumulation of waste, deforestation and loss of biodiversity. This crisis has been further exacerbated by the realities of the armed conflict. In the absence of an adequate Government response to the dire humanitarian situation, Tierra Digna sought to get a legal decision stopping the use of heavy machinery and toxic chemicals for mining in the Atrato River, arguing that the informal mining activities did not only cause irreversible damage to the environment, but also to the human rights of the communities. The Government denied responsibility for the human rights violations. 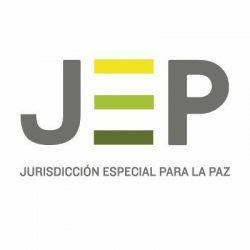 The Colombian Constitutional Court found that the state authorities were indeed responsible for violations of the right to life, health, water, food security, the right to a healthy environment, as well as the cultural and territorial rights of the claimant ethnic communities. 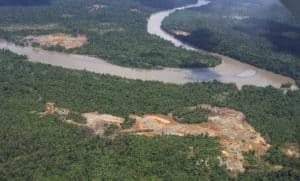 The authorities had failed to comply with their constitutional obligation to take concrete and effective measures to stop the illegal mining activities, thereby causing a serious humanitarian and environmental crisis in the river basin of the Atrato River, its tributaries and the surrounding territories. 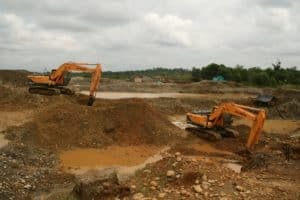 The Constitutional Court was satisfied that informal mining activities around the Atrato River had gravely contaminated and threatened water sources and forests. It stated that “whereas water is not explicitly listed as a right as such in the Constitution, the Constitutional Court does consider it as a fundamental right, because it forms part of the essential core of the right to live in dignity. This is so not only where water is designated for human consumption, but water must be considered as essential part of the environment and is vital for the life of multiple species in the world.”  This means that natural water resources must be protected to ensure the preservation of ecosystems that form the basis for an adequate standard of living. In an unprecedented interpretation of constitutional law, the Court went as far as pronouncing the Atrato River itself as legal subject with specific rights regarding its protection, conservation, maintenance and rehabilitation. Regarding the right to food, the Court determined that the contamination of the river had threatened ethnic communities’ access to food and forced them to give up their traditional ways of producing food. Instead, the mining activities had imposed a model of development on the communities which is incompatible with their ancestral practices, thereby eroding social structures and traditions. Mining activities have re-shaped the traditional ways of life of ethnic communities at the Atrato. In accordance with the precautionary principle (i.e. Principle 15 of the 1992 Rio Declaration), the Court stated that whenever the harmful effects of an activity are uncertain, authorities have the duty to opt for a solution that prevents possible harm. In other words, the Government is legally obliged to take measures to anticipate and prevent damage to communities, or – if the harm has already occurred – it must adopt compensatory measures. This being said, the Court concluded that the government was liable for the violation of the rights of the communities to food security and water. The Court also criticised that government authorities had not coordinated their actions to address the problems: The Ministry of the Environment and the Ministry of Agriculture had both separately implemented some agricultural programmes, but failed to coordinate a joint and effective policy. The Court then ordered a prohibition of the use of toxic chemicals, such as mercury, in any legal and illegal extractive activities in the future. The Court acknowledged that mining activities have had a strong impact on ethnic communities and their territories, generating displacement, elevated school drop-out rates, high levels of violence and prostitution and an erosion of traditional forms of subsistence, including artisanal mining. This has affected communities’ right to physical, cultural and spiritual survival. Notably, the Court highlighted that in the absence of sufficient state control, this is a threat posed not only by informal and illegal mining, but also by licensed or “legal” mining activities. In this context, the Court reiterated the transcendent nature of communities’ right to informed and prior consultation before legal extractive projects can be developed – not only in Chocó. 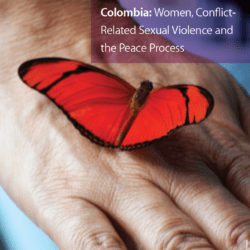 Based on an extensive analysis of international law , the Court introduced the concept of biocultural rights into Colombian constitutional law, thereby recognising the direct interdependency between nature, natural resources and the cultures of ethnic communities and Indigenous Peoples. The Court emphasised that an ecocentric approach to human rights acknowledges that preserving biodiversity is intrinsically linked with the preservation and protection of different forms of human life and cultures. In summary, biocultural rights are the precondition for the rights of ethnic and Indigenous communities to exercise territorial autonomy in accordance with their own laws and customs. This includes the right of communities to administer the natural resources in the territories in which they have developed their culture, traditions and their special relationship with the environment and biodiversity. 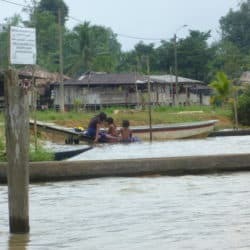 Communities in the Atrato region depend on the river. Develop a plan to clean up the water sources of Chocó, starting with the Atrato river, rehabilitate its ecosystems and prevent further harm. Draw up a joint action plan to stop illegal mining in the Atrato and its tributaries. Confiscate heavy machinery and prohibit the use of toxic substances in the Atrato River. Adopt a comprehensive action plan to recover traditional forms of subsistence and food production, taking account of the specific needs of ethnic communities and their right to food security. 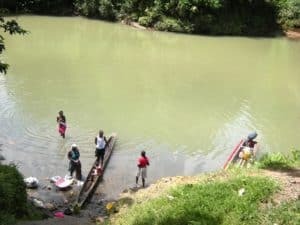 Conduct a toxicological and epidemiological study to determine the degree of contamination of the Atrato River and the effects on the health of the communities. Establish a “Commission to safeguard the River Atrato”, which should be composed of members of the various ethnic communities, the government and experts. Develop a plan to strengthen regional institutions and enhance their capacity to tackle all forms of illegal mining (i.e. provide sufficient financial resources, institutional capacity and staff). Make sure that all legal mining projects strictly comply with the obligation of conducting a prior consultation with communities that could potentially be affected by the planned activity. Regulate the gold trade to end impunity for corporate actors that have been directly or indirectly funding illegal armed groups, drug trafficking, organised crime or illegal gold mining. 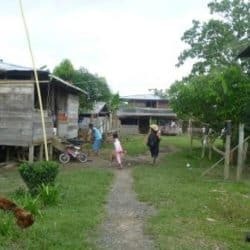 That all the actions listed above are conducted in close consultation with Tierra Digna and other civil society organisations working with and representing ethnic communities, such as Cocomopoca and the Inter-ethnic Solidarity Forum Chocó – FISCH (Foro Interétnico Solidaridad-Chocó-FISCH). A review of the national mining policy to ensure environmental sustainability as well as compliance with constitutional law and international human rights law. The Atrato River, which originates in the Western Andes and flows into the Caribbean, is 750 km long and the biggest fresh water source in Colombia. The main river basin and its tributaries provide water to the Chocó region, which is one of the most biodiverse regions in the world. The river banks of the Atrato are part of the ancestral territories of several Afro-Colombian and Indigenous communities, whose subsistence depends on the river. The ancestral way of life of those communities is shaped by the ecosystem of the river, where they have traditionally practised artisanal mining, traditional agriculture, hunting and fishing for many generations. 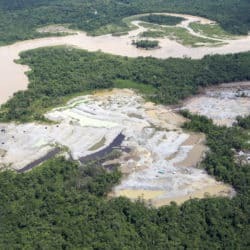 However, as a consequence of the proliferation of informal gold mining in the region, the Atrato River and its tributaries are also among the most contaminated in Colombia. The intensive and large-scale extractive activities and the use of mercury for gold mining have damaged the environment. This has had serious repercussions for the ethnic communities and the natural equilibrium of the ecosystem they live in. See paragraph 9.45 of the judgment. 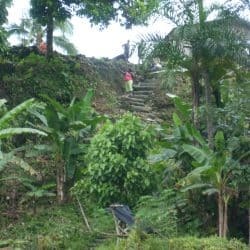 The Research Centre for Social Justice, “Tierra Digna” is a Colombian NGO and a partner of ABColombia members that has been working on the defence of communities who are negatively affected by mining and other mega projects. They also provide legal, investigative and training support to guarantee communities’ access to justice. Their lawsuits against the Colombian government have led to ground-breaking legal decisions in Colombia, including the suspension of three executive decisions demarcating 516 specific zones as “Strategic Mining Areas” in 2015. 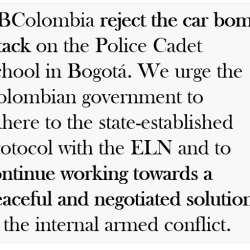 These facts had been confirmed by the Colombian ombudsman. Cf. 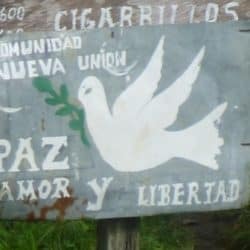 Defensoría Delegada para los Derechos Colectivos y del Ambiente: “Minería de hecho en Colombia” (2010); Defensoría del Pueblo, “Crítica situación de derechos humanos en Chocó por impacto de la minería ilegal y enfrentamientos entre grupos criminales” (2014). The Court consulted a number of international treaties and declarations, including the ILO Convention 169 concerning Indigenous and Tribal Peoples in Independent Countries; 1992 Convention on Biological Diversity; 2007 UN Declaration on the Rights of Indigenous Peoples; 2016 OAS American Declaration on the Rights of Indigenous Peoples; 2003 UNESCO Convention for Safeguarding Intangible Cultural Heritage. Tierra Digna brought the legal case in representation of the Consejo Comunitario Mayor de la Organizacion Popular Campesina del Alto Atrato (Cocomopoca), el Consejo Comunitario Mayor de la Asociación Campesina Integral del Atrato (Cocomacia), la Asociación de Consejos Comunitarios del Bajo Atrato (Asocoba), the Inter-ethnic Solidarity Forum of Chocó (Foro Inter-étnico Solidaridad Chocó – FISCH) and others against the President and others. Defendants included: the Ministry of the Interior, the Ministry of the Environment and Sustainable Development, the Ministry of Mining and Energy, the Ministry of Defence, the Ministry of Health and Social Protection, the Ministry of Agriculture, the Ministry of Housing, Cities and Territory, the Ministry of Education, the Department of Social Prosperity, the National Planning Department, the National Mining Agency, the National Agency for Environmental Licenses, the National Health Institute, the Departments of Chocó and Antioquia, Codechocó (Autonomous Regional Agency for Sustainable Development in Chocó), the Sustainable Development Agency of Urabá (Corpourabá), the National Police Unit against Illegal Mining, the National Ombudsman, the Comptroller General, the Inspector General, various municipalities and others.